The MOZ biannual survey is out! It’s always the most interesting summary of where the world is at in terms of SEO (Search Engine Optimisation) — and that’s because it’s so utterly thorough. Its sampling technique (to pick 150 industry leading SEO experts and ask them what they think is important for SEO) is unparalleled and nobody even bothers to imitate it. 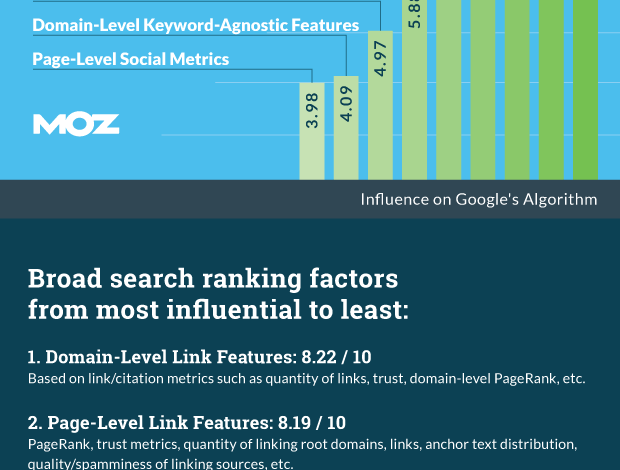 By combining all the top thinkers on the subject, MOZ shows the big patterns of how SEO works and what we should all be doing to get our sites to perform well on search engines. There is a huge amount of detail (and thankfully, a good summary) on the report here, but I wanted to briefly focus on one angle: the growth of CTR (clickthrough rates). Back in May of 2014, Rand Fishkin of Moz undertook an interesting experiment to see how Google search results could be improved by (in this case, falsely boosting) click-through rates from Google’s search results (read more here). Ultimately, it proved that click-throughs from the search engine were going to be of growing importance in search results. This is important because, for years, the SEO people have tried to hone their magic brew and get all the factors — on-site and off-site right. Whilst these are still massively important, to some extent they can be cooked-up or falsified in some way, and Google has struggled and fought hard to stay one step ahead. Click-through rates are Google’s best way of doing that and will remain of high importance. This is primarily because they are hard to falsify. People have tried and will try to use bots and other means (including what I suspect to be poorly paid humans performing click-fraud campaigns in what are basically modern-day sweat-shops) — but click-throughs are hard to emulate and ultimately, Google has the control and knowledge (because the clicks come from its own search engine). have confidence in Google to get it right. Google’s reputation depends on getting it right. It will keep trying. monitor and understand what traffic actually converts.